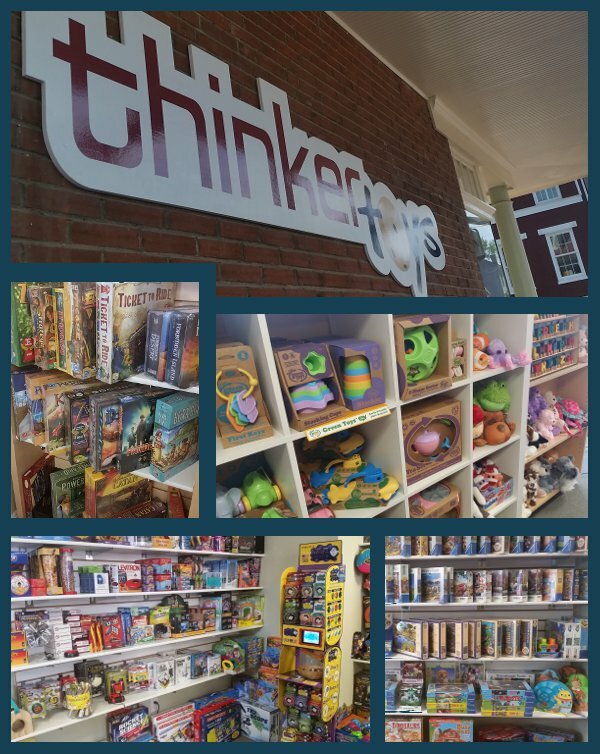 Thinker Toys is your friendly local Specialty Toy Store! We're located in downtown Winchester, VA on the Walking Mall across from the Splash Pad. The best way to experience our store is to stop in, but if that's not possible, then please check out some of our favorites on our website. Don't hesitate to call us with any questions. Customer service is our specialty. We have toys you don't find in the traditional big-box store. Whether its wooden toys or blocks for younger kids, or games and puzzles for the entire family, the focus is creativity and imagination. Activity inspiring outdoor toys are great for nice weather days, but you can also find arts and crafts projects, or science kits, for when the weather isn't cooperating. A few of the toy companies we carry are Melissa & Doug, Ravensburger Puzzles, Klutz, Folkmanis Puppets, Schleich Animals, Green Toys, Blue Orange Games, Thinkfun, and lots of others you may not be familiar with. We love the classics as well, such as Yo-Yos, Slinkys, Tinkertoys, ant farms, Erector sets, Carrom boards and more! Whatever the occasion, or the age of the "kid", come in and we'll play with things until you find exactly what you didn't know you were looking for.